Do You Stuff? 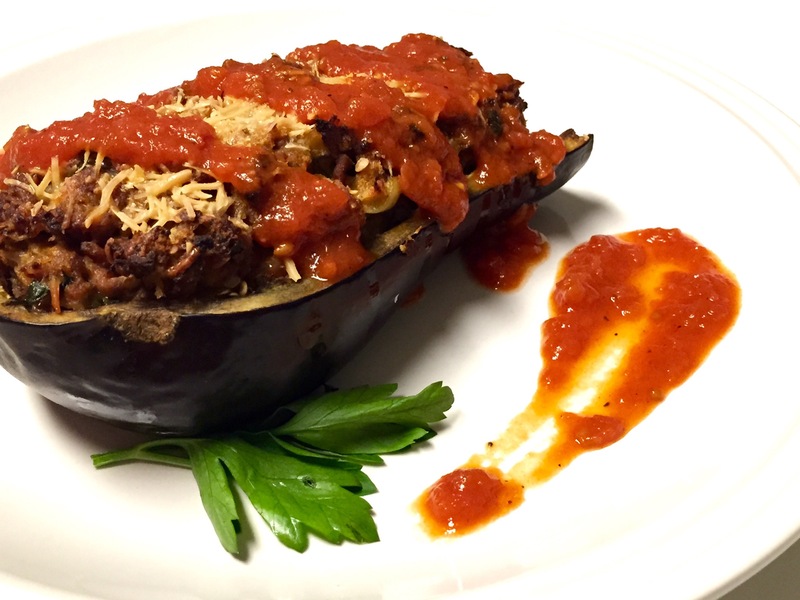 I Stuff… Beef-Stuffed Eggplant – Pao Says, "Open Wide!" One of my favorite colors is purple. So obviously, when I walk past the farmer’s market on Tuesdays, I can’t help but gravitate towards the colorful eggplants. After picking up a beautiful, fresh eggplant, I had to think of a creative way to cook it so that I could also use the ground beef in our fridge. For dinner tonight, I decided to stuff the eggplant with a ground beef mixture and top it off with, what else, cheese… Of course! Cut the eggplant in half lengthwise and scoop out the inside while leaving about a half-inch of meat to give it some structure. Take the piece(s) of scooped out eggplant and put them in a boiling pot of salted water until tender (about 7-8 minutes). Pour some oil (about a tbsp or so) into a saucepan and heat it up (med-high). Add in the chopped garlic and onion and cook until translucent. Add the ground beef and season with about a tsp of salt and half a tsp pepper. Brown the meat and break it up with a wooden spoon. Once the meat is cooked, drain it of some of the excess grease and then put the meat in a bowl. Drain the eggplant, cut it into pieces, and add it to the meat. Add in 3/4 cup of the parmesan cheese, 1 cup of marinara, the parsley, 1 egg, and the breadcrumbs and stir to combine. Spoon the mixture into the hollowed out eggplant halves (pile them up high!) and top with the remaining parmesan cheese. Drizzle with olive oil and then pop them into the preheated oven for about 40 minutes. Once they’re done, top them with some marinara and serve! **you’ll probably have some meat mixture left over… Stay tuned for a round-two recipe tomorrow!